A well-kept, nicely manicured lawn is a priority for many home gardeners. Keeping their yard looking top notch is something they both enjoy and pride themselves on. To help finish off the look, it's important to make sure the grass is perfectly edged around the flower and garden beds if you have opted to forego plastic edging or edging stones, allowing the grass to abut the soil. It also helps to keep errant grass from encroaching into the garden space. 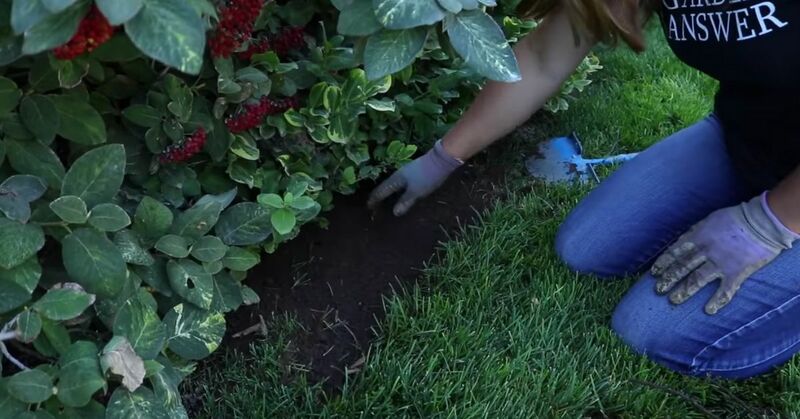 The following tips will help perfectly edge the grass and keep garden beds pristine. It's best to tackle this project in the spring before the grass starts growing like crazy, creeping into the flower and garden beds. The soil also tends to have more moisture making it easier to remove sod. Take a few minutes to decide your plan. Are you just looking to clean up the edge a bit or are you wanting to expand your garden beds? Walk around your beds and start thinking about your garden needs. When planning the demarcation between garden beds and the lawn, keep in mind the mature size of plants in the coming growing season. It may be necessary to move the boundary out a bit more than expected to allow for this growth. Some gardeners like to mark their boundary out before starting, and others just wing it as they go. If you're the. type that likes to have a guide you can mark the boundary with spray paint, string, or simply lay a garden hose down on the lawn. Using the steps found at Garden Season, use a step edger to "cut" the grass along the boundary line. After the edge has been cut you can remove the sod by pulling it out in pieces or rolling it up. These chunks can be used elsewhere in the yard if you have bare patches that need filled. Using an electric, gas-powered, or battery-operated trimmer, keep the edge of the grass trimmed every time the lawn is mowed. Turf Magazine has some great tips on how to trim and edge the right way. Sometimes the garden and flower beds grow a little more vigorous than we expect, so it may be necessary to touch up the edge once or twice during the growing season. A little maintenance here and there though will keep it from being a huge project next spring.